Hello, and happy Thursday, in November we did the Simply Sweet Christmas Inspiration Hop. The decision was made to do a monthly Keeping Christmas Inspiration Hop. 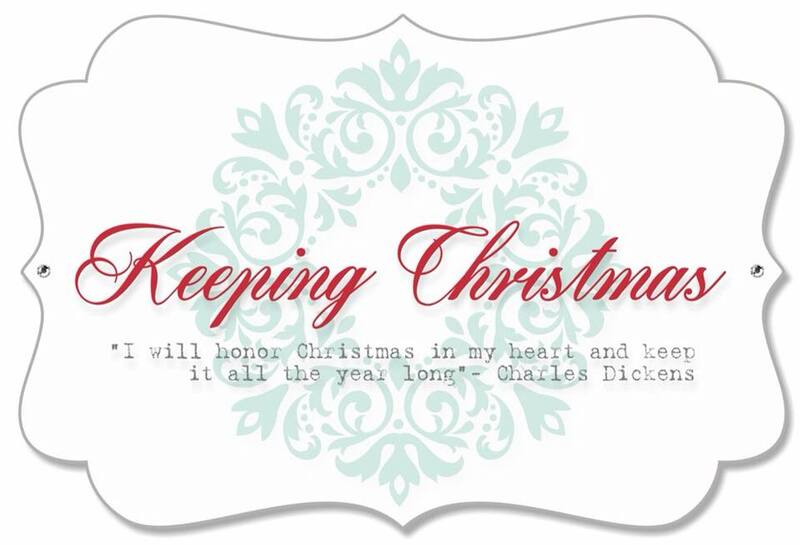 We will be sharing Christmas creations on the 25th of each month. Keeping Christmas is hosted on Kelly Lunceford blog, she has been posting Keep Christmas for some time now. My card is pretty simple. 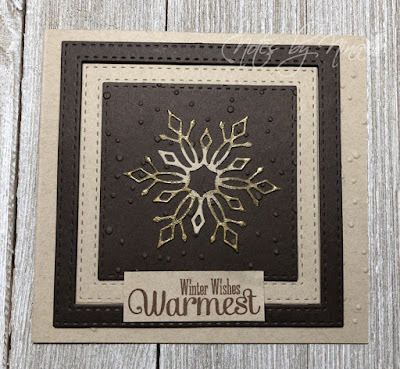 I used a snowy embossing folder to add texture to my card base. I die cut a snowflake and added some heat embossing in gold to the edges. I added that same texture to a square panel that I glued the snowflake too. I used stitched squares to make frames in kraft and chocolate brown, alternating with foam tape to add some dimension. I finished with a simply stamped sentiment. I apologize for the low-quality picture I was digitally challenged with my camera ;). 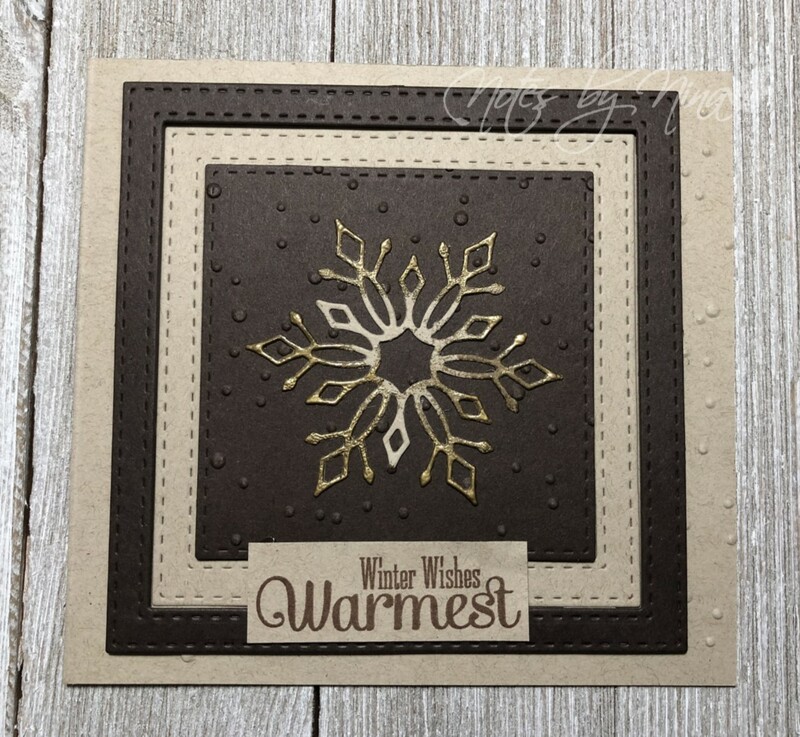 Supplies: Kraft and brown cardstock, Papertrey ink - Snowflake Flurries, Memory Box - Lindeman Snowflake, embossing folder. I am obviously not alone in this hop, so hop along and be sure to visit each blog. There is a lot of inspiration and ideas to get your creative juices flowing. Very pretty card Nina. Love the snowflake and layered frames. Thanks for sharing. This is so pretty, Nina! Oh, how pretty! Love the earthy tones and that big beautiful snowflake. ❤❤❤I love Kraft and black!!! This is beautiful!!! Beautiful card, Nina! I love the browns, it's so warm and comforting and showcases that snowflake beautifully. Reminds me of a quilt square. Have a great weekend! This is such an elegant Christmas card. I love how warm and comforting it is. Great color combo and I love how it looks like a quilt square! Pretty card. Love the colors you used. Remember the dark ages, before stitched dies existed?! Love this card--very very warm and has both a modern and a retro vibe!